According to the Iowa Department of Transportation (DOT), driving or riding in a vehicle is the most dangerous activity a teen can do. In an effort to save the lives of Iowa's teen drivers, the state has initiated a Graduated Driver Licensing (GDL) program where teens must reach certain milestones prior to getting a driver's license. On your path to your Iowa driver's license, your first step is to obtain your learner's permit (or learner's permit). 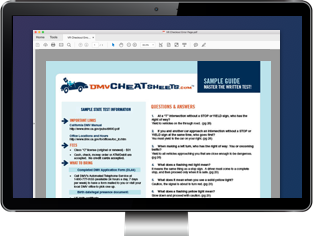 Below you will find all the relevant information, including behind-the-wheel driver training requirements and how to pass your written exam on your first attempt by using an online practice test. If you need additional information, you can always call the DOT at (800) 532-1121. You hold the learner's permit for 12 months consecutively before applying for an Iowa license. You have completed an approved Driver’s Ed course. Your driver record has been free of accidents and moving violations for 6 months. You have completed at least 20 hours of supervised driving time (see details below). To get your learner's permit in Iowa, you must be at least 14 years old. The permit is valid for 4 years and expires on your birthday. Your learner's permit must be held for a minimum of 6 months before applying for a driver's license. Having your parent/guardian accompany you when you apply. Proof of identity (e.g. valid and unexpired U.S. passport or passport card, certified copy of a birth certificate). Verification of Social Security number (SSN) (e.g. Social Security card, Social Security Administration 1099 Form, pay stub with your SSN on it.). Payment for the $6 fee. The Iowa learner's permit test is based on information about Iowa traffic laws, road signs, and safe driving techniques contained in the Iowa Driver’s Manual. In addition to this exam, you'll also need to take and successfully pass a vision test. To help you prepare for the written exam, the MVD offers a basic practice test. If you really want to ensure passing on your first attempt, we suggest preparing with an online practice test that's offered from our approved partner. Once you have your learner's permit in your possession, you're required to complete an Iowa-approved Driver’s Education course. Your course must be taught by a public or private high school, or by a state-licensed driver's education school. Unfortunately, the DOT does not recognize an approved online Driver's Ed course for Iowa at this time. 6 hours laboratory instruction; 3 hours must be behind the wheel in a vehicle. Simulators may be used for the remaining time. For more information, please refer to our Driver’s Ed in Iowa page. In addition to Driver's Ed, you're required to complete 20 hours of behind-the-wheel supervised driving during your permit phase before getting your intermediate driver's license. This must include at least 2 hours of driving practice between sunset and sunrise. Your supervising driver must log your hours on the driving log located in the parent driving guide. Note that once you get your intermediate driver's license, you'll need to complete an additional 10 hours of driving practice. You must have your learner's permit in your possession at all times while driving. The amount of passengers you can carry is limited to the number of seat belts in your vehicle. You must always be accompanied by a supervising driver. A parent/guardian or immediate family member over 21 years old. A driver over 25 years old with written permission of parent/guardian. You may obtain a new driver's permit once your current permit expires, or replace one that has been lost or stolen by visiting an Iowa driver license station and presenting the documents mentioned above. For more information, please refer to our Replacing a Lost License page. Upon completion of all the steps mentioned above, you'll be a proud owner of an Iowa learner's permit. Now it's time to experience what life on the road is really like. Your next step in the GDL is to get your intermediate driver's license. For more information, please refer to our Teen Driver’s License page. Please be aware of your surroundings whenever you're in the driver's seat. That way, our roads will be much safer for everyone.